It’s also worth noting that we don’t limit you to a single website or platform. If you have 3 Wishlist websites with different products you want to sell access to, that’s not a problem. You can connect each site with ThriveCart and then set multiple products in your ThriveCart account to connect to the different membership platforms you’ve integrated with. There are also other ways to integrate ThriveCart with your membership platform via your autoresponder. There are numerous membership platforms that integrate with your autoresponder service and provide access to your site’s content by tagging your contacts. So you can see with ThriveCart you’ve got a wide range of possibilities and ways to integrate with membership platforms. But let’s go take a look at how you can get started and integrate with one of the platforms we natively integrate with. Head over to your Settings area in your account. Click on the view button next to integrations. 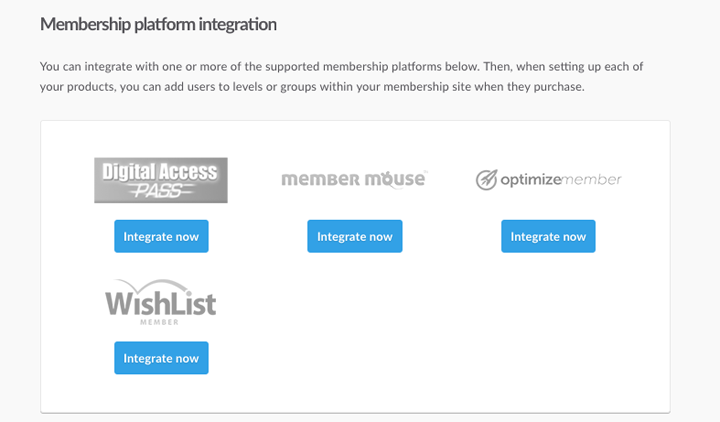 From the list of integration services, we want to locate membership platforms and click the view settings button. We’ll then be shown the various membership platforms you can integrate ThriveCart with. Clicking on the integrate now button for one of these platforms will take you through to the page with the integration details and full instructions.